Always 5 Blue-Rays For A Week $12. No "Hot Hits". All VHS tapes rent for 3 nights. 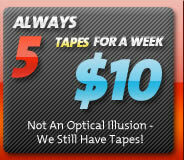 Always 5 Tapes For A Week $10. 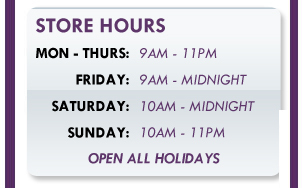 All games rent for 3 nights. 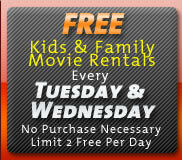 NOTE: Games with a rental price of $2.50 and under CAN be rented as part of the 5 for a week special. We can resurface, clean and polish ANY disc.